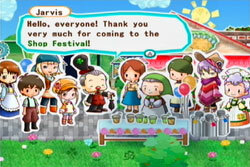 At the beginning of the game, there won't be any festivals available. Jarvis will eventually tell you that he feels inspired to research some of the festivals that would occur in Clover Town. The festivals appear to be random occurrences. You may spend weeks without a festival in-game and then suddenly have the same two within 7 days of each other. If you have triggered a festival, you will be notified by the festival master of ceremonies as you exit your house when you start playing for the day. The festival MC	will wait for word of your participation by your shop. To please the judges, you will need to have a variety of ingredients (crops and animals), a lot of shop decor, and a large number of regular customers. The shop judging won't begin until after you talk to Jarvis once the festival has started, so this gives you some time to add decorations to the outside of your shop. You will win 5000 G for taking first place. 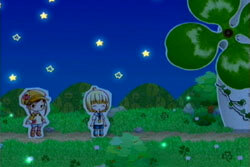 After you watch the meteor shower with your special friend, the evening will end and you will return to your house. 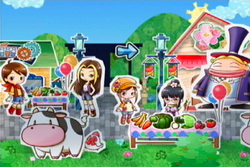 Mint will inform you about the Farm Festival, a day that is set aside to giving thanks to nature. She explains that all of the area farmers compete together to see who has the best crops and livestock, and the winner's produce gets to be offered to the Harvest King. If you are declared the winner, you'll be rewarded by 5000 G.